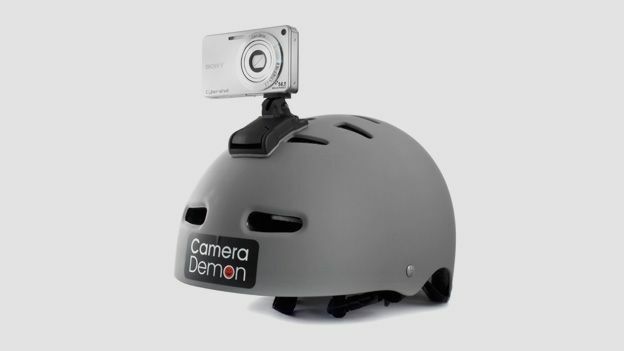 The somewhat awkwardly named Camera Demon Helmet Camera Mount attaches to your helmet and will fit any compact camera, letting you capture your adventures from your POV for posterity. At £25, it's far cheaper than a GoPro, though it does have its downsides. About the size of a matchbox, the Camera Demon Helmet Camera Mount is basically a rectangle of plastic, so will fit easily in any pocket. The actual camera mount part slides out from the base that sticks to your helmet. It feels sturdy, and will take a few knocks no matter what you're using it for. The main selling point is it'll work with any compact digital camera, saving you a few bob (providing you already own a cam, that is). But it won't work with mobiles, which is a bit of an oversight, considering almost all film in HD nowadays. It attaches to your helmet using a 3M high bonding pad, and once it's in place, it's not going anywhere. When you're ready to start filming, you can tilt your camera up or down, and turn it through 360 degrees. Setup takes just a couple of minutes. Find where the mount best fits the curvature of your helmet, and clean the area on your noggin protector using the supplied alcohol wipe. Then peel off the sheet from the 3M adhesive pad, and press it in place. It's advised to leave it overnight to bond fully, but after less than 20 minutes we were racing round a go-karting track at 65mph and it stayed in place perfectly. Once it's on you won't notice it's there, unless you're using a massive camera, that is. Then you might get a crick in your neck. You'll need a chum to check it's in place and you're not filming just the floor or the sky. And you can't really stop and start without taking your helmet off, which is a bit fiddly. To remove the mount once you're done, you'll need to blast it with a hairdryer, and it'll come unstuck without leaving a mark. Unfortunately you can't use it again once removed, so it could be an expensive few minutes if you're renting the helmet. The results depend on which camera you're using. We used a Sony T9, which was handy, as you just press one button to start filming rather than fiddling around with lots of menus. Then to stop, flip up the lens cap covering. The Camera Demon Helmet Camera Mount is a neat little doohicky. You can't just sling it on and get going, but setup won't take you long. And it's much cheaper than a lot of wearable action cams. It's a shame you can't use your mobile with it, and it'd be nice if you could swap it onto another helmet, but at this price, you can't really argue.